A few weeks ago, P. and I had an unusually quiet Sunday at home, of the kind that made us search for activities in the afternoon. Des trucs à faire ! Despite the fact that we had had a hearty breakfast — as we always do — followed quite soon by a more than satisfying lunch, by 4 pm or so, P. told me: “J’ai faim” (I am hungry). “Ben mange un morceau de fromage avec du pain,” I suggested, even if I knew that this was not going to do anything to him. I felt as if I was talking like my mother! Bread and cheese? Perhaps I was more thinking of what I would have eaten had I suffered from a similar craving. “What about an apple or a banana?” I went on, enthusiastically. By looking at him I knew that I had to think about something more clever. This was obviously not doing anything to him. Boring! He looked back at me swiftly, his whole face suddenly lit by an enormous smile. In fact, I knew it before even saying it. I know him that well. But then, this does not require too much thinking because this is how much P. likes any types of puddings when they use rice and milk. And why not after all! Rice puddings are deliciously smooth and really easy to make, can be flavored as you like — with vanilla or cardamom, as examples. Served with cooked and fresh strawberries, this sweat treat is excellent, no matter what time of the day, à quatre heures or as a real dessert. Il n’y a pas d’heure pour en manger ! (there is no special time to eat rice pudding). Try it, come on! You will be surprised! Strawberry season is still with us, profitons-en ! In a small pot, dissolve 1/2 cup sugar with the water and bring to a gentle boil. Wash and dice half of the strawberries. Add them to the syrup with four cardamom pods and the lime juice. Simmer on low heat for about fifteen minutes. Let cool and remove the cardamom pods. In the meantime, rinse the rice under cold water. Bring the milk to a first boil with 6 cardamom pods and then slowly pour the rice in. Reduce the heat, cover and simmer for 30 minutes, or until the rice is cooked but stays al dente. Remove the cardamom pods and mix in the rest of the sugar. Let slightly cool in a bowl. Add the remainder fresh strawberries, sliced. Serve with grated coconut if you like. Dans une casserole, faites dissoudre 100 g de sucre avec l’eau, et amenez à ébulition. Lavez les fraises et coupez la moitié en dés. Ajoutez-les au sirop avec quatre capsules de cardamome, et le jus de citron vert. Cuisez sur feu doux pendant 15 minutes. Laissez refroidir puis retirez la cardamome. Pendant ce temps, rinsez le riz sous de l’eau froide. Amenez le lait à première ébullition et ajoutez le riz en pluie, avec le reste de cardamome. Réduisez la température et cuisez le riz sur feu doux, à couvert pendant 30 min. Retirez les capsules de cardamome et ajoutez le reste de sucre. Laissez refroidir dans un bol. Une fois les fraises cuites refroidies, mélangez-les délicatemen au riz. Ajoutez le reste de fraises coupées en tranches. Servez, avec de la noix de coco râpée si vous le souhaitez. Béa, are you kidding …. no special time to eat rice pudding … any “now” would be a special time to eat rice pudding! Wow on the strawberries! oh mais quelle jolie recette! pleine de subtilité, toute en détails.. merci, ça illumine ma journée! your pudding has the perfect consistency! Bea, please serve me with a HUGE bowl! 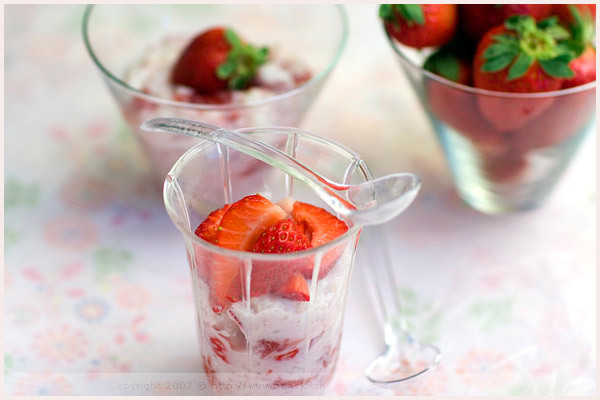 I also made something similar, but pureed the strawberries, the whole thing was just utterly creamy! Trop bonne idée. Le sait-il ce monsieur P. qu’il a vraiment de la chance? Il y a des hommes qui ont de la chance. I love the color of the rice with the strawberries, Bea – it looks delicious and refreshing! This is an ancient recipe,that my gammy usually did for us in my childhood,without strawberry ,but with a rain of cinamon on the top. The photo is super with nice colors. Found some unusually good strawberries the other day, but I have to admit, rice pudding never occurred to me. We just ate them standing at the kitchen counter, juice dripping off our chins. That was fabulous, but this looks lovely. this is a great idea! right now I have 1,5 kg of strawberries behind my back so…. 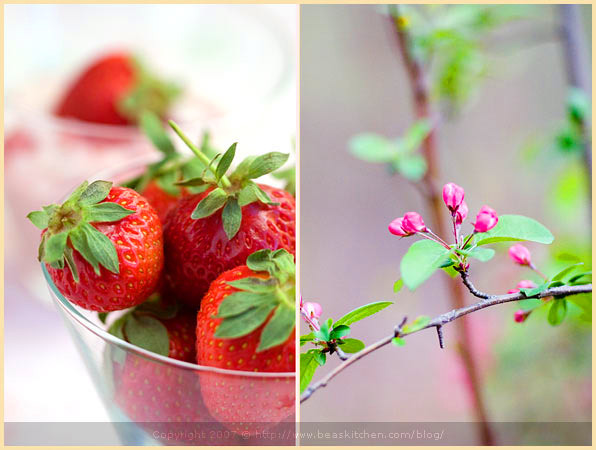 What a joy to find your beautiful blog on a warm Friday morning in May! I am inspired by your photographs to work harder on my own. Now, if only our strawberries had arrived already in Ontario! Even my boyfriend, who usually craves chocolate as a dessert, fell for your recipe. 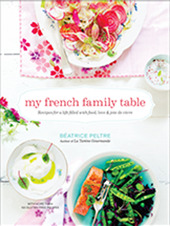 Béa, allow me to say, like so many before me, that you are not only a magnificent cook (I guess, should taste it first of course), an excellent writer but also (!!) a superb photographer!! My goodness. Your site has such beautiful photography and writing…and you post so often! Thank you for the opportunity to experience your gorgeous blogging. Béa, good to be back on a strawberry rice pudding day, i have everything i need and a daughter really willing to try this kind of sweet treats ! Thanks ! That looks absolutely delicious! I’ve had fun sorting out through your last few posts, which I unfortunately missed because my computer broke. 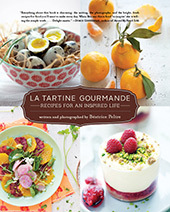 Those were dark days, but it’s all better now since there are lots of new recipes to try out. Thank you for that wonderful idea, and not too messy and time consuming either. I will make some rice pudding today, I have some rhubarb here, that will have to do, though. Roasted, with a little bit of sugar (had the tastiest rhubarb strudel yesterday at Demel’s *wow*). Have a great weekend, and thank you for the time you dedicate to this blog, to bring us all these great pictures and recipes! I love rice pudding and this looks so, so good! I love this pudding! Wonderful idea with the strawberries! Wonderful! I grew up with classic vanilla and raisin rice pudding– grandfather’s favorite! I have only had regular/plain rice pudding (with a little cinnamon)…this looks absolutely delicious! Oh this is really making me miss summer! I think that the issue is that sometimes comments get improperly caught into my spam folder. Sorry about that and thank you for your comment! Leonine, merci encore une fois. Tanna, oh yes any time, and thank you! Alhya, merci, Je suis contente que cela t’apporte un petit rayon de soleil. Gattina, ahah, it is all gone. I will have to make some more to satisfy your craving. And have to check yours. I am sure it is delicious, as you know well to do! Mary, j’espere qu’il le sait 😉 Moi aussi finalement, j’ai de la chance. Gracianne, ah oui, tu as bien raison. Heureusement, il me soigne bien! Patricia, thank you for your visit and comment. Sylvia, cinnamon is a great touch indeed. I will have to try this too! Thank you for the tip and comment. Christine, I am like you. Fresh strawberries will always be the best, anyhow. Ilva, oh nice. I am sure you will make great things with them! Cannot wait to see. Catherine, thanks so much for your sweet note. No strawberries yet in Ontario? Jeff, you have to convince her! L, thanks so much for your complimentary note. I feel honored to hear you enjoy my blog! Renee, thank you so much. I again feel very touched by your note. Framboiz, eh tu es de retour! Youpi! J’espere que toi et ta puce allez aimer! Jelena, great to hear. So welcome back! Merisi with rhubarb, it is sure to be excellent. What a great idea too! Thanks for your visit and nice note. Justine, nice to hear you like it. Fraisier recipe will come soon 😉 When is your birthday? Connie, yes you describe it well, I feel! Sarah, thank you. Your grandfather’s version is great. Isn’t it funny to see that it seems to be such an ancient recipe? Jenjen, oh I bet. But you surely will have a great fall. I loved your market pics! And so sorry Valentina that you were not able to post your comment. I will add it below. It must have been caught in my spam folder. 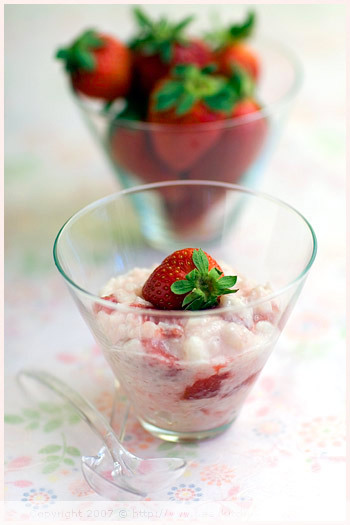 I really loved the strawberry rice pudding recipe. I might try it with barley or even quinoa. Must think a bit about which one will be best. Oh this is absolutely beautiful. What a wonderful combination of flavours and such lovely photos! the last picture is absolutely stunning! That looks good! I like the use of the cardamom in it.